New Year’s Eve Party 2015! Home | Cross-Canada Solidarity News and Events | New Year’s Eve Party 2015! CELEBRATE THE CUBAN REVOLUTION & DANCE UNTIL MORNING! STRUGGLE, REVOLUTION, JOY & DANCE! 10th Annual New Year's Eve Party! CELEBRATE 57 YEARS OF THE CUBAN REVOLUTION! Delicious food, drinks, live music, a salsa dance lesson, DJ 100FUEGOS, DJ CARLITOS TUNES TUNES & all the dancing possible! 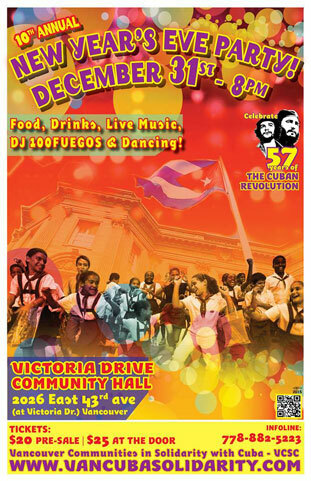 Come ring in the New Year with friends & supporters of the Cuban Revolution! Pre-Sale Special Group Rate: Buy 4 tickets and get the 5th ticket for FREE! DJ 100FUEGOS – Last year's sensation! Spinning favourites from Cuba, Latin America & around the world! DJ CARLITOS TUNES TUNES – From El Salvador, new DJ this year! Spinning music for you to dance and enjoy! MARIA MELENDEZ – Latin-American classics from a multi-talented musician with an amazing voice! MX KATRACHO – Singing live Ranchera music from the soul of ‘Nuestra America’! EL TROVADOR BETO FUENTES – Get ready to dance during this great live performance! FOOD – Delicious Salvadoran and Middle Eastern cuisine! DRINKS – Famous Cuban drinks- Mojitos, Cuba Libres…and more! RAFFLE – Win prizes and take home a reminder of your favorite New Year’s Eve! PHOTOBOOTH – Create lasting memories! SALSA DANCE LESSON – A chance to practice your moves for the dance floor! DANCE, DANCE, & MORE DANCE!